Having a cat live inside with you means a few big responsibilities. Probably the first priority is making sure they know how to use their facilities, and that means litter training them. Using a litter box is actually instinctual for most cats – a place where they can use the bathroom and easily bury it is ideal for them. And while teaching a cat to use a litter box may not always be a smooth process, if you follow – and stick with – the following steps, you’re sure to find success. One quick safety note: You don’t want to handle kitty waste if you’re pregnant or think you could be pregnant. If this applies to you, delegate the kitty training elsewhere. You’ll want to find a good location that will award your cat a certain amount of privacy and peace. Cats usually do best with their litter boxes out of the public eye, so look for a room that he has access to all day but isn’t in a social, gathering spot. A laundry room or utility room often works well, but even a lesser used bathroom can be an ideal place for your cat to go. Also keep in mind that you should try to have one litter box per cat, plus one. (If your home allows for that kind of space.) So three cats means four litter boxes; one cat means two litter boxes. You may find your cat favors one or another but, especially in the beginning, it’s good for them to have options. You want to make sure the size is appropriate for your cat. If you have a small kitten, don’t pick a box with sides that are too tall for kitty to easily step into. For larger cats, you’ll want to steer clear of the boxes with smaller hoods. 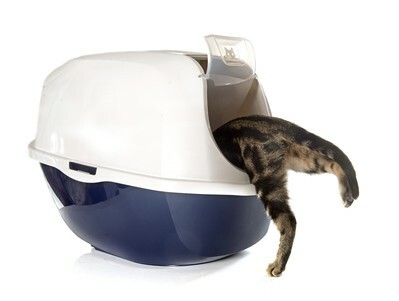 Picking a hooded litter box may help contain the smell and offer your cat a bit extra privacy – which can go a long way to coaxing your cat into actually using the box. You’ll want to make sure your cat becomes familiar with the box as soon as possible. Once it’s set up, make sure your kitty activity is near the box so that she gets used to it. If the box is in a room with a door, you may want to consider closing the two of you in until she does the deed. If you’re able to pick up some kind of pattern or schedule on your cat’s potty habits, you may be able to help her time it just right. Make an effort to play by the box when you think she should be due to go. If you notice she has specific tells that indicate she is about to go (i.e., scratching or pacing), pick her up and place her directly in the box. Once your cat actually goes in the litter box, you may want to consider rewarding with a feline-friendly treat. Positive reinforcement is always encouraging. Note that after you’ve coaxed her to potty in the litter, you want to make sure she’s burying it (you’ll appreciate it, and so will she). If she doesn’t do it automatically, you’ll need to show her how by burying it for her with a few fingers. Always remember to wash thoroughly after your training sessions. Accidents will happen along the way. Don’t just throw the mess out – put the waste where it’s supposed to go. Putting it in the litter box and even burying it will show her that you really mean it; that’s where it goes. Leave it there as long as you normally would if she were to have put it there herself. Clean the accident thoroughly so your cat doesn’t smell it afterward and think that’s the potty spot she should use. If he starts a habit of messing in a specific place outside his box, try placing his food in that place to let him know that’s not an appropriate place to eliminate. No cat wants to be near excrement (not even their own). So the more full the litter box, the less likely they are to use it. You’ll want to scoop out the clumps daily and do a full clean once a week. A full clean means dumping the litter and washing the litter box with soap and water, drying thoroughly, and refilling with litter. Keep enough cat litter on hand to scoop and clean the box regularly. Learning new tricks can be stressful for both the student and teacher. Remember not to yell or hit your cat as they make mistakes. Making him scared of you will do nothing to help him control his waste, and your relationship will ultimately suffer.